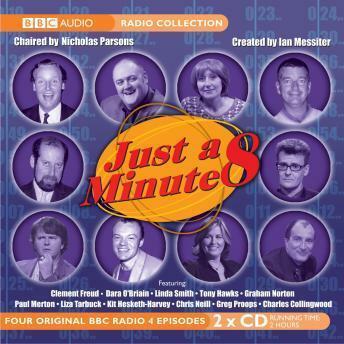 In this selection of four more editions of Just a Minute, Nicholas Parsons once again attempts to keep control over the proceedings, as well as over panellists Paul Merton, Kit Hesketh-Harvey, Liza Tarbuck, Charles Collingwood, Clement Freud, Linda Smith, Tony Hawks, Chris Neill, Graham Norton, Dara O'Briain and Greg Proops. As the players attempt to speak for sixty seconds without repetition, deviation or hesitation, the subjects covered range from 'My Favourite Pudding' and 'Curiosities', to 'Fake Tans' and 'The Best Dressed Member of the Panel'. Eloquence, wit, imagination and a sharp ear are the qualities required for the game, and the hilarious results are here for all to enjoy.